What I like best about working with words is that it combines passion and play. Falling in love with an idea or an image or a story, envisioning a book from a mass of raw material, arranging the material in a form that most clearly expresses the heart of the book—all that can be done in a spirit of play. Passion enables you to stay with it through doubt and difficulty, trusting that it will all be worth it to reach those moments of feeling, Yes, this is it—that sense of rightness when the words produce the effect you aim for. After polishing text and seemingly endless refinements, you may discover that the piece of writing you’ve brought into the world is grander, deeper, and more precious than you ever could have imagined. The joy of working with words sustained me through 35 years of editing and 12 as a small publisher. I now spend more of my time writing—in which the work is even harder, and the joy more intense. For several years I’ve worked with a Chinese translator to edit a major historical work by his father, historian Xuan-Zhi Dai, on secret religious societies in China. The challenges can be daunting, but the translator and I work well together, and in our effort to clarify concepts that have no direct equivalent in our two languages, we see revealed fundamental differences in our cultures. I learn so much in this collaboration; I am humbled at how much I do not know. And I’ve gained deep respect for the art of translation. My main strength in writing comes from years of editing: the willingness to revise, rethink, rewrite, as many times as necessary. I heard on the radio that only amateurs enjoy writing. I’m definitely an amateur; I truly love the process. The book I’ve recently finished (and for which I’m seeking a publisher) deals with music, cross-cultural misunderstanding, the freedom that follows disillusionment, and finding one’s true work. I am grateful to the North Carolina Arts Council for a Regional Project Grant, which I used for something I’ve long wanted—a professional critique for my own writing. Peggy Payne, a writer and writing consultant in Raleigh, offered invaluable insight and feedback, plus I’m wild about her books. See Sister India and Revelation at www.peggypayne.com. More recently, my work has been edited by Barbara J. Hardie, an altogether illuminating and enjoyable experience. 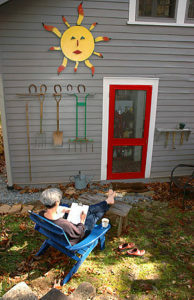 Barbara teaches writing at Southwestern Community College in Sylva, NC (bjhardie@gmail.com). My recent reading has tended toward very long novels. It started with a tattered copy of War & Peace that has been on a bookshelf here for generations. Vikram Chandra’s 900-page Sacred Games was a fine distraction following dental surgery, and Roberto Bolano’s 2666, another 900 pages, I found disturbing, baffling, and utterly compelling. I’d just started the even longer Tale of Genji when on an impulse I joined a Proust group and so re-read Remembrance of Things Past (now In Search of Lost Time), which I’d wanted to do ever since I first read it many years ago. Isabel Wilkerson’s Pulitzer Prize winner, The Warmth of Other Suns: The Epic Story of America’s Great Migration (a mere 550 pages) led to other African-American writers, including superb Library of America volumes on Zora Neale Hurston and James Baldwin (1000 and 870 pages, respectively). After feasting on the five Neapolitan novels of Elena Ferrante, I’m now deep into Karl Ove Knausgaard (3,600 pages!). here & beyond . . . 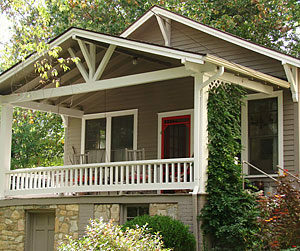 I live in a century-old cottage near the Great Smoky Mountains of western North Carolina. Around sunset, I often make the three-mile walk down to a lake and around, over a dam at one end and a footbridge at the other, past hemlock and spruce, persimmon and mimosa, a rose walk, a butterfly garden, people fishing, dogs retrieving, a dilapidated boathouse, abundant waterfowl, ducks, geese, and swans, with seasonal appearances from coots, wood ducks, and herons. Behind my cottage I have a small vegetable garden, a stretch of weed-wildflowers (daisies, sweetpeas, goldenrod, Queen Anne’s lace), and a stand of trees, where I discovered a spindly hearts-a-bustin’ (Euonymus americanus) with four dazzling seed pods, spiky rose casings split to reveal glossy orange seeds. In addition to my long-term interests in work, gardening, films, and Zen practice, I am newly enthusiastic about Slow Food and Small Houses.